If you think bubble wrap is just for padding out moving boxes and for sending delicate parcels in the post, you'd be wrong! There are lots of practical ways to put it to use around the home - you'll wonder how you lived without it before! If you have a particularly draughty spot in your home, you can use bubble wrap as extra insulation. You'll be able to cut your heating bills quite drastically without spending a fortune renovating. Line walls, windows, and close gaps with a sheet of bubble wrap. If you suffer from road rage or if you're an anxious driver, having something to pop will help to de-stress. Just take some pieces of bubble wrap and tape it securely around the wheel. If your sleeping bag is less than comfortable, lay some thick sheets of bubble wrap on the ground and then sleep on top. The bubble wrap will provide insulation from the cold floor below. You'll also find it's very comfortable - a bit like a blow-up bed! Keep them warmer for longer. 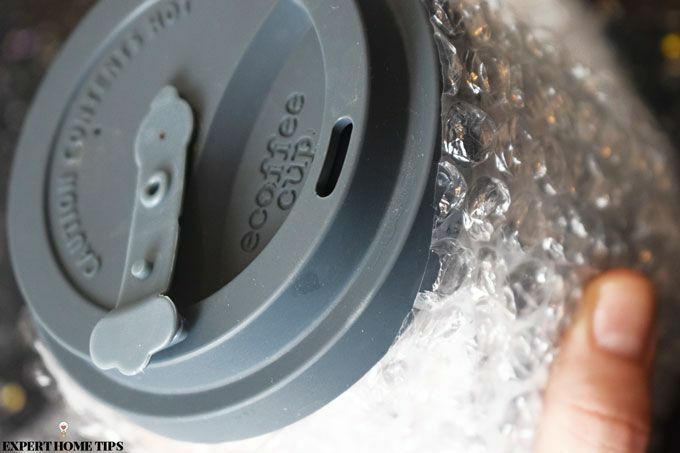 If you like to take a hot beverage on the go, but the heat never sticks around for long enough, insulate your travel mug with some bubble wrap. You'll be surprised by just how much heat it locks in. Stuck in a pinch? Make yourself a fetching outfit out of bubble wrap. You're sure to get a lot of attention, but we can't guarantee any prizes for best-dressed! Always getting blisters from using your garden tools? Brooms and spades don't have the most comfortable handles, so why not add some additional cushioning with bubble wrap? Do your feet ache after a long day? Make yourself some extra shoe support with bubble wrap. Take a pair of your shoes and trace out the bottom onto the bubble wrap. Cut around the shapes, removing an extra inch or so from the edge. 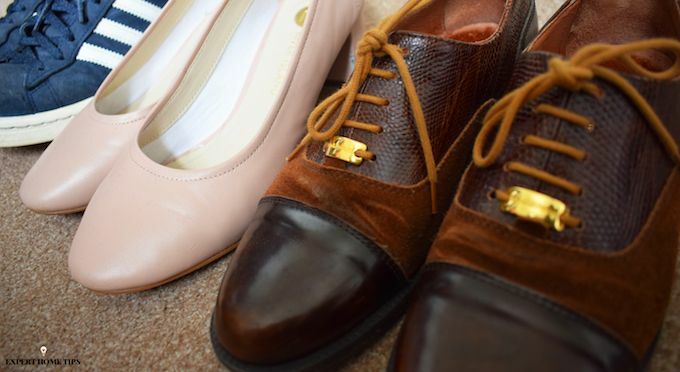 Pop the insoles into your shoes and try them out! It'll be easier to clean. Want a more clean, organised fridge? You could buy shelf liners, but why not make your own using bubble wrap? Bubble wrap is perfect for keeping fruit from getting bruised and for cushioning eggs. Cut to size and lay on top of each shelf. Replace as necessary to keep your fridge hygienic. Use bubble wrap to stamp paint onto paper. This hack is great for painting with kids, but also looks magnificent printed onto fabrics for a unique tablecloth or cushion. Take a piece of bubble wrap and roll it up until it resembles a roller. Starting at the tip of your hair, take a section and begin winding your hair around it. Once you reach the scalp, tie the ends of the bubble wrap together in a knot. Leave them in overnight or until your hair is dry to reveal beautiful curls. You'll achieve damage-free curls without splashing out on a fancy set of rollers. If your fine china is stacked in a cupboard, you might want to think about giving it some proper protection. 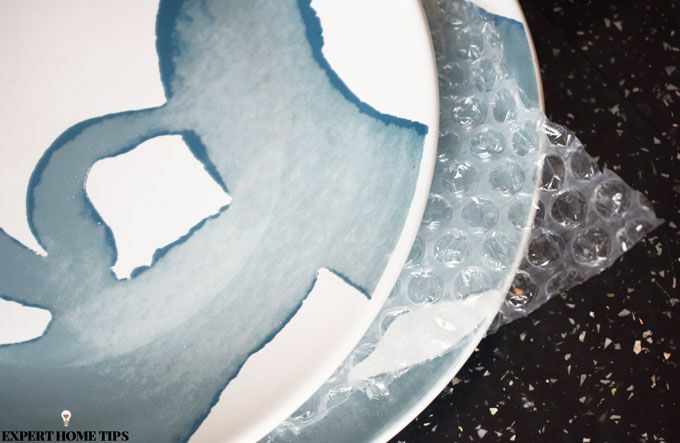 Take some bubble wrap and cut it to the size of your plates. Sandwich the gap between each dish to prevent scratches and chips. Fashion some bubble wrap shoes. Download and print a template to make your own bubble wrap calendar. Instead of crossing off days, you can pop the bubbles. Stuff them with bubble wrap. If you've ever got to the bottom of your wardrobe and found a flattened pair of shoes or a crumpled bag, this is the tip for you! Use bubble wrap to stuff your accessories and help them maintain their shape, no matter what lands on top of them! Protect your plants from harsh weather conditions by loosely wrapping them in bubble wrap. Because the wrap is see-through, it'll act as a mini greenhouse. Does your back need a little bit more support in the office or while driving? Pad out a cushion cover with bubble wrap. 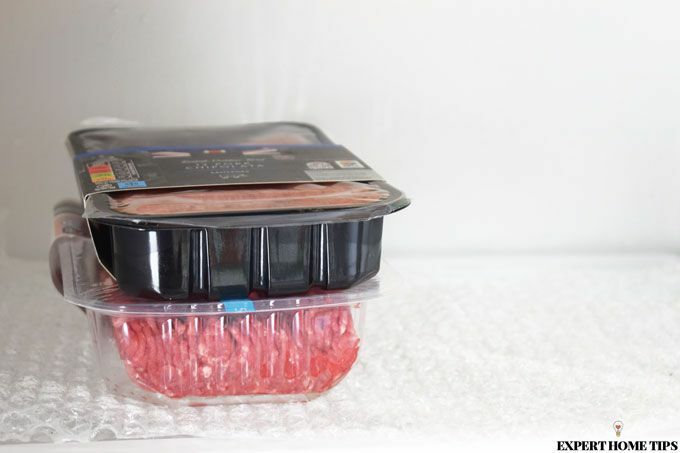 Bubble wrap is great for insulating frozen goods. Do you ever worry about your frozen shopping melting before you get it to the freezer? 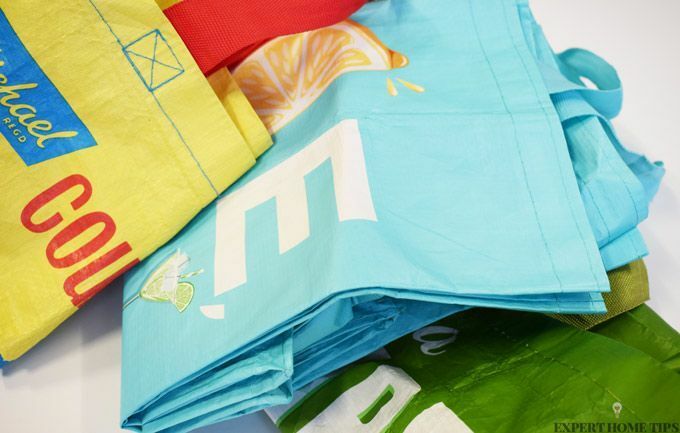 If yes, it's time you upgrade your bags! Make a bag liner out of bubble wrap, and glue it to the inside. It'll provide extra insulation to keep your food cold. 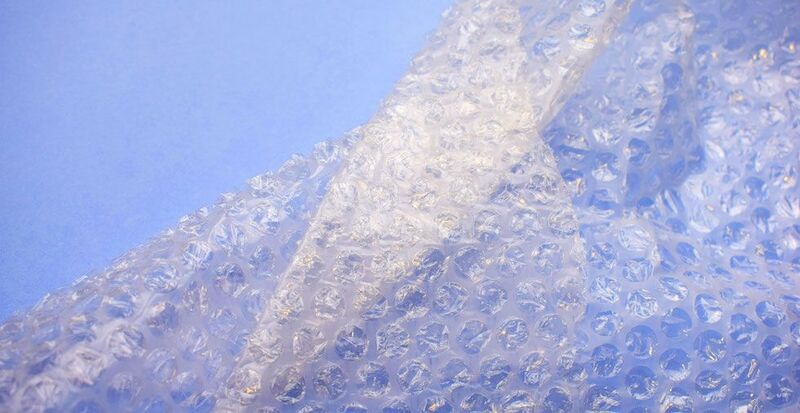 Do you know any clever uses for bubble wrap? We'd love to hear from you in the comments below! I triple wrap my compost bin with unwanted bubble wrap from shops veg boxes, (recycling as well) in winter. That certainly is one of the joys of bubble wrap! Great idea, Marianne! Bubble wrap will stop fruit from bruising too. Put a strip or two depending how wide it is across the windscreen in cold weather, it works just as good as the ones you buy, put the bubbles on the underside. then just shake it when you take it off. Great idea, Margaret! Thank you.